Do you have experience with web design? Have you made your first dollar with that skill? If you answered yes to both, the entrepreneurial bug has hit you. That’s how I felt when I got my first paid job. The client was a local contractor who did work for my parents, and my dad told him that I built websites. It was a basic 5-page HTML website, took one night to create, and I made $100/hour on the project. At that point, you realize how much control you have over your income when you work for yourself, compared to relying on a salary. 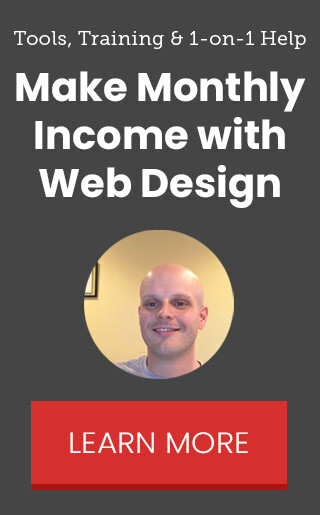 Even if you haven’t made money yet with web design, when you have an above-average skill, you deserve to put cash in your pocket when you offer your services. 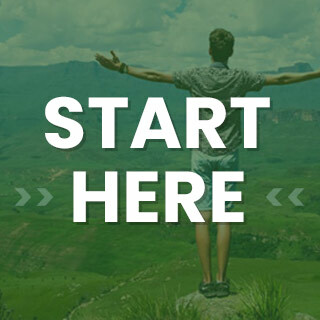 That task is daunting to every beginner, especially those who want to take it to the next level into sustainable monthly income. That’s why I want to talk about what to consider when you develop a web design business plan. The biggest mistake I see is people who want to work with ALL types of businesses. When it comes to sales messaging, your offer will be too general to stand out from competitors in a fierce market. That’s why you need to pick a “business niche” that interests you and become an expert. EXAMPLE: If I only build websites for Italian restaurants, I can talk with potential clients about a reservation system, how we can grow an email list to get more customers in the door and show them examples of what their website and menu will look like online. You’ll also want to look for people with shared values or interests. Doing so can make a cold introduction easier when you have something in common. It’s not possible to know about someone for real until you get to work. After 3-5 projects with various personalities, you’ll begin to identify traits of the good & bad clients, so you become better at selecting them in the future. The most powerful way to capture the attention of a potential client is by showing them results you’ve got for a similar business. That’s why you can gain traction faster by working within one industry. There are so many ways to get a website today. However, you’re likely to find certain trends when you search for web design businesses that have clients near you. The main takeaway is that you don’t want to align yourself with the lowest prices in the market because you become a commodity and can’t offer the personalized service that is often necessary to gain traction at the beginning. The other thing that can happen is you begin to feel “imposter syndrome” when you start comparing yourself to others that are seemingly successful. That’s why you must have an abundance mindset because there is enough to go around between you and your competitors! 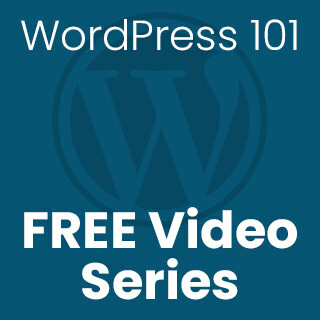 While you can go the manual route of hand-coding a website, I’m partial to WordPress, a platform that powers a large portion of the web and makes it easy to customize. Starting a web design business is a low startup cost venture because all you need are domain registration ($20/year), web hosting ($300-$500/year), and premium WordPress themes/plugins ($50-$300/year). Then your workflow can become more efficient when you add productivity apps like Google Drive (free), Dropbox ($100/year), and Adobe Creative Cloud ($600/year). My WordPress theme of choice is iThemes Builder, and my new favorite is Divi by Elegant Themes. I selected Builder many years ago and have stuck with it for years on all of my client and personal websites (including this one). My only two clients who didn’t follow through on projects were those who signed a contract. We never finalized the websites largely due to lack of communication on their end. Both of these contracts were for approximately $2,000 combined. Do you think it was worth it to get a lawyer involved? Ultimately, I moved away from contract work for this reason. There is no doubt a place for contracts with more detailed projects and high-cost, high-risk jobs. It just wasn’t the business model I prefer. Instead, I was able to upsell the clients that I did hourly work for at the beginning into a monthly website maintenance package – and some of these clients have been with me for eight years. When you charge on a monthly basis, the recurring revenue starts to add up with only a handful of clients. It proved to be a much more sustainable business plan for web design. Your goal is to increase your monthly charge and build more value into that cost, so you don’t have to rely on constantly bringing in new clients for one-time project work. One way to create loyalty is by tracking all leads on your client’s website using Google Analytics (emails, consultations, or phone number clicks) and providing them detailed reports along with ideas for improvement. Your clients will begin to view you as a member of their team instead of an outsourced freelancer. As you gain new skills, you can increase your income by offering services such as business reputation management, SEO improvement, link building campaigns, email marketing, e-commerce, video, content strategy, advertising management. RELATED: How Do Google Ads Work? You must invest in education to learn and keep up with the latest trends on the web. Last but not least, make sure to over-deliver when it comes to communication. In my experience, it’s common for clients to have bad past experiences with unreliable web designers. The most common complaint is NOT a lack of technical ability, but seemingly simple tasks that did not get taken care of promptly. The bottom line is to tell your clients what you’re going to do, how long it will take to complete, and give it to them early to earn extra trust points. 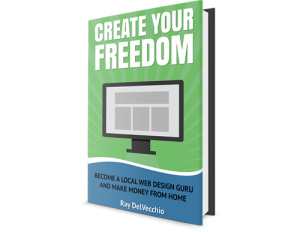 Many people have dreams when it comes to quitting their job, making money freelancing and starting their own web design business. However, it’s easy to get stuck in the big-picture phase and lose focus on the daily steps it’ll take to achieve your goal. Ultimately, your goal is going to be unique to your circumstances. Maybe you’re 35, have a good job, just starting a family, and you want to make an extra $5,000 from your hobby to help ease the new mortgage payment. Or you could be a college student who doesn’t feel a passion for their major, and you want to use any free time you have to build the skills to run your full-time web design business after you graduate. With a monthly service structure, work backward from your financial goal to estimate how many people you’ll need to contact. You must reach out to a large number of people to generate a little interest. Depending on your method of attack, you will be lucky to hear back from 2% of them. That can be a discouraging feeling. You must trust and refine your process instead of worrying about short-term results. Make sales prospecting and networking a habit, and think of it as planting seeds that may blossom down the road. Use software to make things easy when tax season rolls around. A few popular online solutions include Wave and FreshBooks. Right now, I’m using an older version of QuickBooks which does a great job but is not the easiest to learn. They also have a newer online option which might work well for you. Even if you rely on a simple spreadsheet, tracking your costs somewhere in an organized fashion is essential to managing your money better with each new client. You’ll also want the ability to send clients a professional invoice. Now we come to the hardest aspect of freelancing – getting new web design clients! You must realize that building a website is relatively easy compared to the art of selling. With web design, you are working towards a result that you have total control over. With sales, you’re dealing with people who have different objections, questions, and expectations of your work. But let’s not overcomplicate things. To make money, you need more clients. That means connecting with decision-makers must be a primary component on your schedule. Keep it simple and select a channel that suits you, whether it’s cold emails or cold calling. Then track essential metrics like the number of contacts compared to the number of responses to be objective with what’s working and what isn’t. Create a simple script to guide you but don’t become a slave to it during a genuine conversation. Allow your curiosity to lead the discussion and ask questions that pop into your mind about their business. Your goal should be to set up a meeting. Start with your local community, because when you can meet in person, it’s an enormous added value to your potential client. It builds trust faster than any other method, you can bring a computer to walk them through examples, and you’re more likely to close a sale when they can hand you a check! Join a local networking group like the Chamber of Commerce and attend their meetings. Or you can find one online on a website like Meetup. They are designed for members to share tips and to find trustworthy referral work. Most importantly, you have to follow-up on all non-responders and be exceptionally aggressive (in a diplomatic way) with “warm leads” that show immediate interest in your service. When you exceed a small transaction, let’s say anything over $50, you’re going to encounter resistance before a person pulls out their wallet. Put another way, you’re not getting an impulse buy! They crave re-assurance in many ways. If the business owner is still deciding but you never check-in, they are likely to forget about you and move on. On the flip side, if they are interested but indecisive, you are helping by pushing them to say yes or no definitively. Stay top of mind, continue to offer advice that shows you are the right person for the job and reach out through all possible channels – email, text, phone, direct mail, in-person. I tried to outsource sales several times, mainly because I’m introverted and don’t like constant social interactions. It was a total failure. It wasn’t because the people I recruited were incompetent. It was because they didn’t have the passion for web design and were not motivated by sales commission with no salary. Ultimately, when you are starting a web design business, success is all on your shoulders. It’s your baby, and you’re the only one who is going to push through the inevitable struggles onto the path of success. Only when you’ve got a process that works for sales should you consider outsourcing. It’s rare (if not impossible) to be good at everything so be kind to yourself if progress is slow!